In Mac OSX 10.5 Leopard the Preview application has been considerably enhanced. It uses Apple's Quartz rendering engine. It now provides a very convenient and flexible way to resize images, and save them in various file formats. In Preview Open the image to be resized. Then select Adjust Size from the Tools menu. A dialogue box opens with the current details of the image. 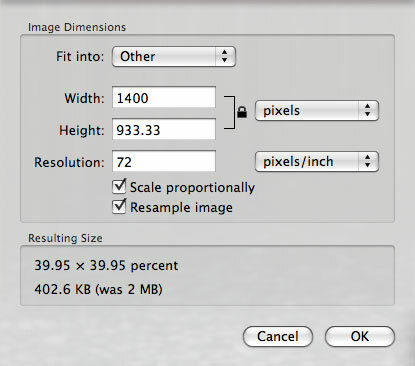 Note that the check boxes Scale proportionally and Resample image should normally be checked. You can change the units and/or the resolution with the pull-down menus. Type a dimension in either the width or the height panel, and the other one will change in proportion. The Fit into menu offers various preset sizes up to the size of the current monitor. 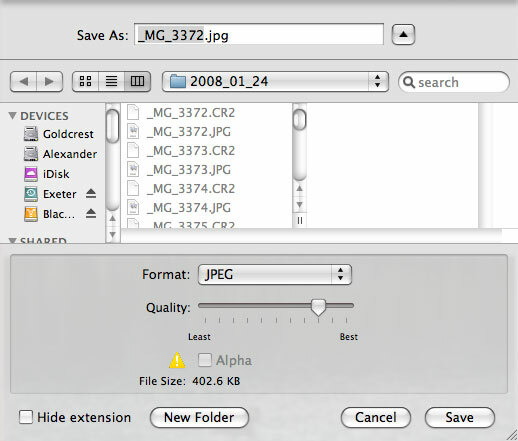 Use File > Save As.. and choose an appropriate file format with a name and destination. 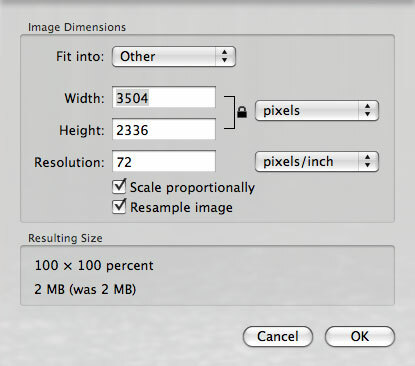 Note that you can specify the degree of compression for JPEG images. When you are satisfied click OK, and you are done.